This presentation of a support group structure is not a unique model you can find in the IT world, but would represent the most common distribution model of roles that apply to Incident Management activities and to other ITSM processes. The great interest in dividing the organization in such clear levels is that IT actors must keep sensitive in understanding well each support group role and responsibility within the whole IT organization. This is a key success factor to keep process flows as fluent and effective as possible. It would also help IT Support organization keeping its credibility and giving confidence to its customers. A responsive and professional Customer Service works accordingly to a clear role distribution scheme and with people doing their job mindfully. Note that in this presentation, the notion of “hierarchy” used to describe the different competence level relates mainly to differences in role, responsibilities, and objectives, not to importance and superiority. ► Fist level (which includes Service-Desk, Customer Services, Monitoring functions, and IT operations) are focused on day-to-day delivery and have as only mission to provide operations and services, accordingly to service level agreements (SLAs). They are driven by end-users satisfaction and compliance with engagements. They are generalist with a global but not deep knowledge over all technologies used within the IT infrastructure and applications areas. ► Second level, are specialists, distributed by technology (or for some by business knowledge domain). They are split between specialist-base support activities and Change Management ones. They generally intervene in system, application or data administration, technical resource allocation. They are not the designers of IT Services and systems, They just ensure the right sizing of capacities, keep performance levels as required, but do not decide for, nor change, choices in technology or functionalities. . Incidents managed by level 2 are generally those linked to administration defects either on infrastructure and application, or due to resource shortage, or even to recover consequences from end-user mistakes. They intervene in all failure in the automation and all industrialization tools required in a live environment. ► Third level, are teams in charge of IT Services designing. They are architects, designers, and developers, work on infrastructure design or applications. Incidents they handle are mainly due to design failure or development defect (as bugs, loop, under-sizing, etc. are).These people are often called Experts due to their high specialization. Often people see a hierarchical level of expertise, but they are just working on a different purpose. All opportunities to share this vision must be taken: at new employee intake, during seminar, kickoff, brainstorming or sharing workshop, in all brochure publication or role description, within the intranet or company’s blog. Management has a central role in this communication, putting in perspective activities of all within the whole IT Services supply-chain, designed to comply with business objectives. The illustration below shows how the 3-levels IT support organization can be seen from the perspective of the Incident Management activities. Scope of responsibilities are clearly distributed by competence levels. Though, cost and duraction by level indicates the necessity to descend the required knowledge for incident resolution to increase the 1st level fixing capabilities, which imprve the efficiency of the whole IT support organization. This is one of the roles of Knowledge Management. Financial and duration time information are given just as comparison elements to understand the interest of using the best way the various support levels. They come from different sources and field experiences. They have been calculated taking into account all the human management costs for investigation and diagnosis, solution design,the fixing, and the recovery efforts to come back to normal operations. These information are not meant to be a benchmark data. The illustration below shows the same 3-levels IT support/competences organization from the Change Management perspective. 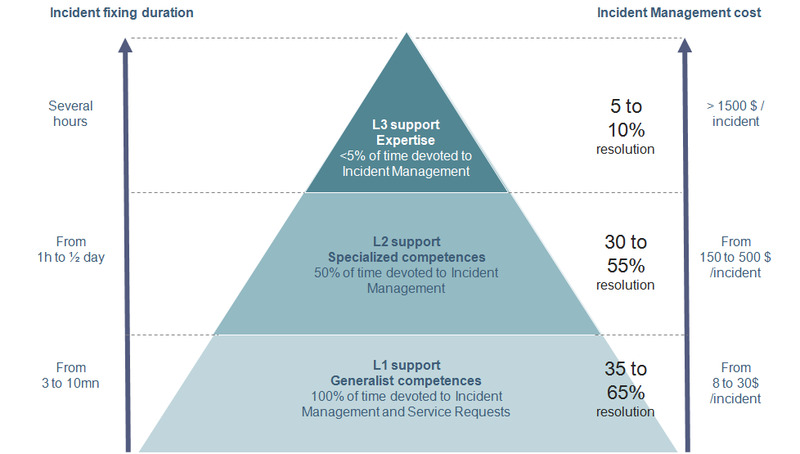 The pyramid is completely at the opposite the Incident Management perspective. the volumes are managed mostly by specilists levels. Thiss pyramid (of course) is just an image to set in mind the main ideas on dedication. Same comments as for Incident Management to be applied to this illustration. See above.